I sponged Distress Inks over the circle starting with the darkest color at the bottom. 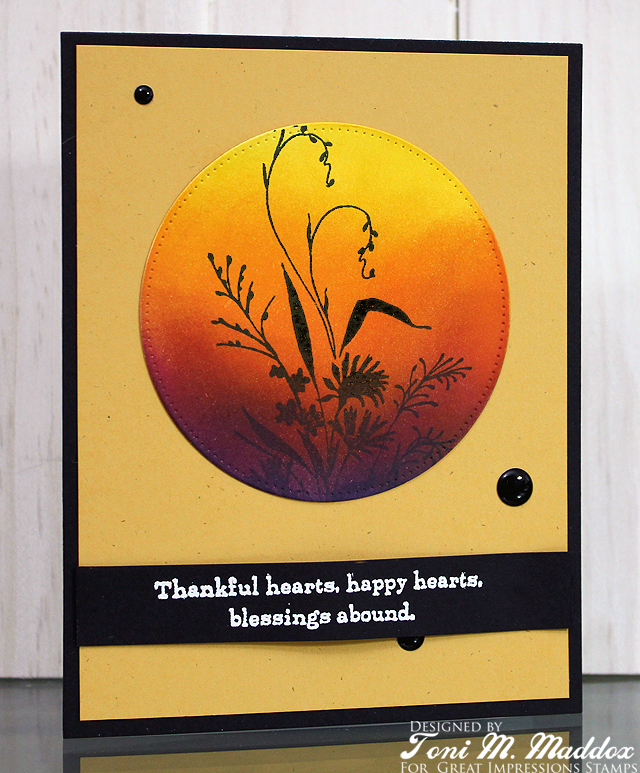 I then stamped the Wildflower Silhouette in a Versafine Onyx Black. 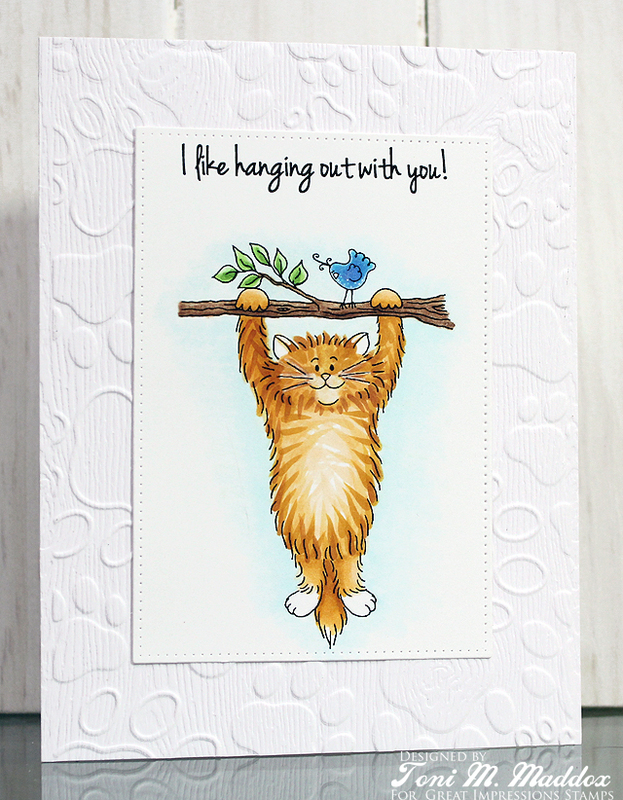 I considered adding the sentiment directly on the background card but wanted more oomph so went with a bold black strip. I kept up the geometric shapes with the black enamel dots. 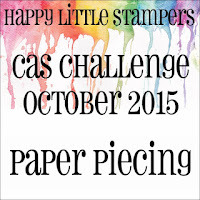 Celebrating Happy Little Stampers Second Release! 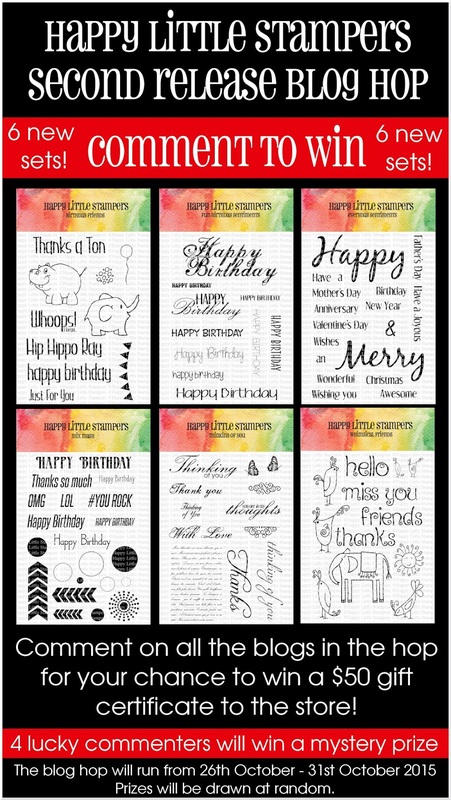 Are you as excited as I am that Happy Little Stampers is releasing another set? Woo hoo! 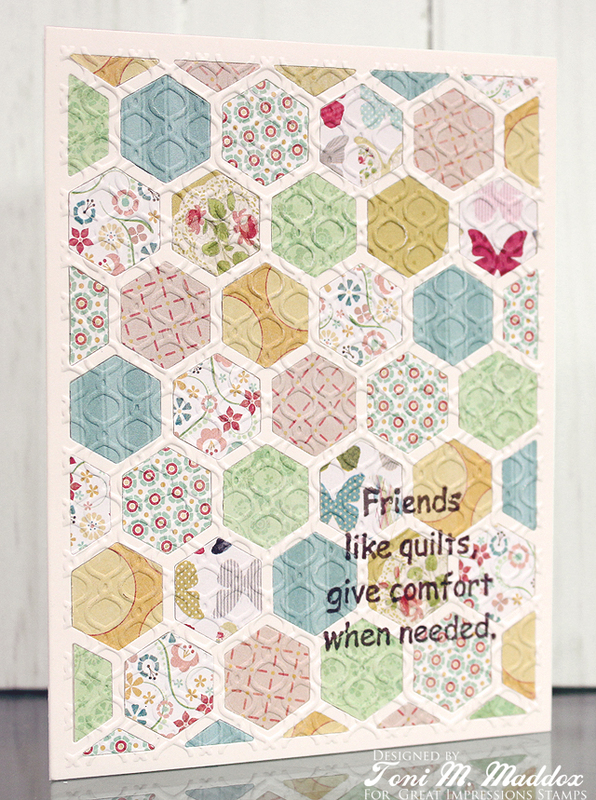 I'm using the Whimsical Friends set--simply could not resist its uber cuteness. 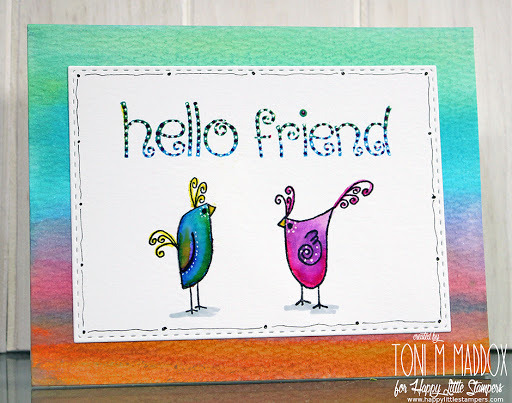 For my card I used Zig watercolor brush pens for the birds, ombre stamped the sentiment then whimsied it all out with a white pigment pen--the birds too), added a doodled border with a Copic .03 pen and laid it all out on a watercolored background. Now keep on hopping because there are many chances to win. 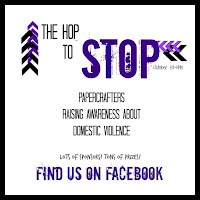 You should have arrived here from Bonnie Klass and are now on your way to Chrissie but if this is your first stop on the hop, why not start at the very beginning with the Happy Little Stampers home page. Toni - you are here!! Hello! Time for another Great Impressions card for you. 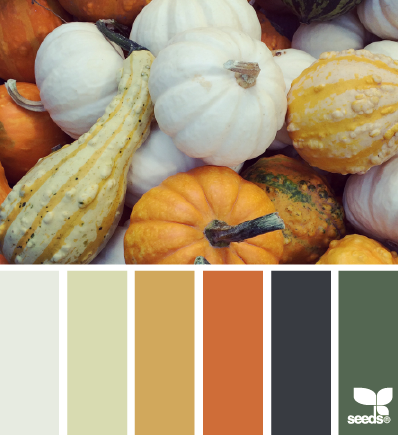 I knew exactly what I wanted to do with the D266 Give Comfort sentiment, especially since we're moving into Autumn. I took my PTI hexagon die plate and first cut it out in cream cardstock before adhering it to Scor-Tape. This is so much easier than individually gluing on the hexagons. Next I die cut a bunch of coordinating My Mind's Eye and Miss Caroline papers then randomly placed them. Here's a tip: as long you don't press hard on the Scor-Tape, you can gently remove the designer paper and reposition it if necessary. I did that in a couple of spots when I changed my mind about placement. 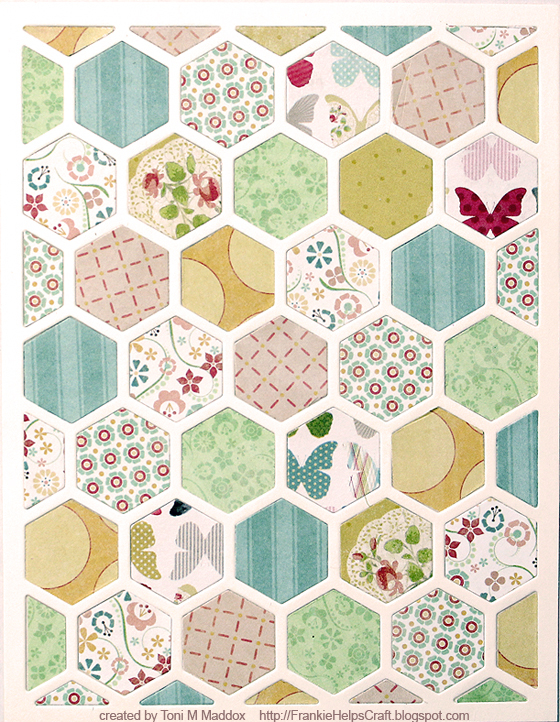 Now I've included a pic of the resulting "quilt" without embossing. This is when I should have stamped the sentiment but I was so eager to emboss I completely forgot--LOL. 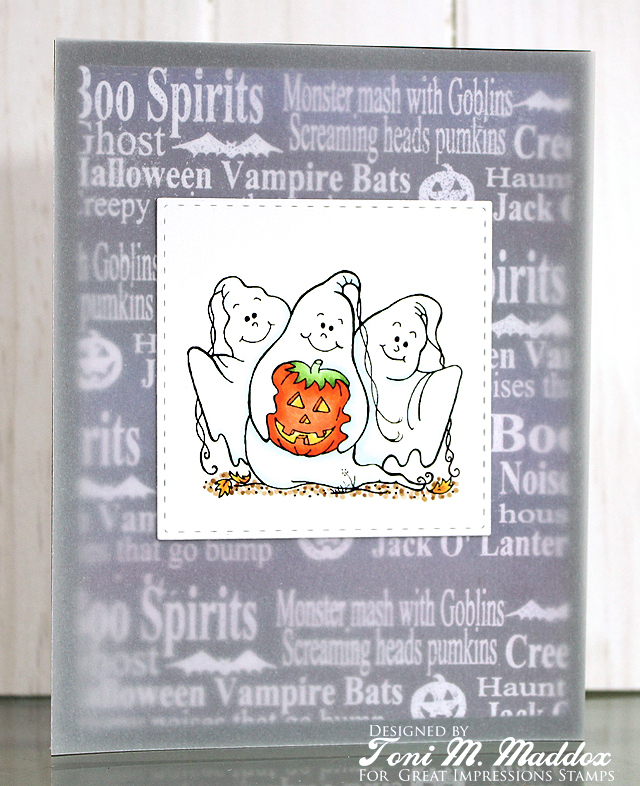 It turned out fine using the MISTI to stamp the sentiment a couple of times. I love how this turned out. The texture is amazing. If only it were this easy to make a quilt in a real life! I created the sentiment (font = clicker script) and used F470 Halloween Owl. 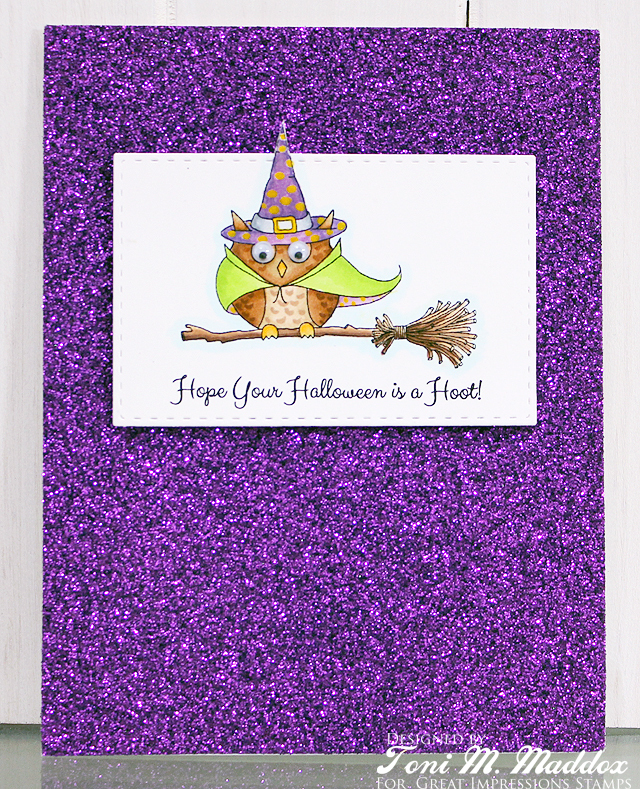 I was originally going to mount the image on wood grain kraft cardstock but am glad I used the glitter purple card stock. So blingy! And it's an easy way to dress up the card. I swear everything is better with glitter on it. LOL. 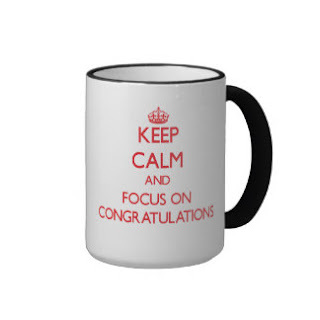 Congrats, Annie LaVallee-Curtis of All My Love Crafts!! 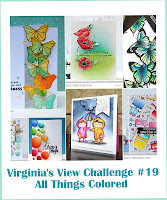 I will contact you via email to get your deets so I can mail you some goodies. Hello! It's time for a new challenge from Great Impressions! Are you ready to create a card for a child? Fun! Here I used G367 Just Hanging Around. 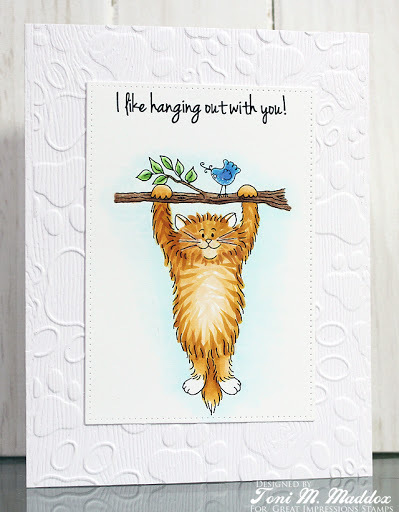 I couldn't resist such a cute cat image since you know I love cats! I didn't try to color this one like my Frankie but instead like a local pet shop's resident cats. They're chubby brothers, orange, and named Mac and Cheese. Squee--I love it! Btw, I used Copic YR20, YR21, YR24 and YR27 for the cat. The sentiment I printed out using a font called Jenna Sue at 24pt. Can't wait to send this out! 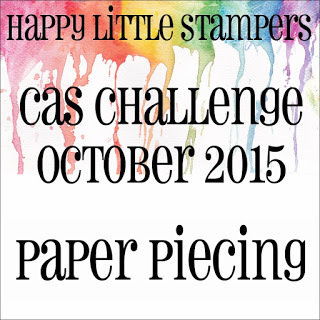 Today is the start of a new Happy Little Stampers CAS challenge featuring paper-piecing. I feel like I have been waiting for this moment forever and a day because I always thought this elephant's dress was ideal for piecing but had never got around to it. I'm sure you can relate so dust off those gems and join us! Btw, we have a special guest this month, Sylvia of Poppy's Papercraft Patch. 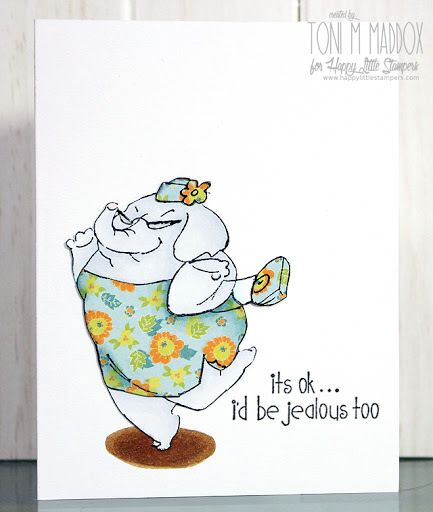 Do stop by and leave her some love on her fab card. You'll be inspired again by Sylvia during our mid-month inpiration post so do check in again. For my card I decided to paper-piece all of her outfit--I mean obviously someone as glamorous as Miss E wouldn't have it any other way. I then took my BG72 Copic to shade a bit. I love the effect. You'll notice that I listed Stazon as the ink I used; that's because the paper has glossy orange flowers which other inks can't stick to. Stazon worked a treat. Today is Lenae's birthday and we are helping her celebrate with cards galore. 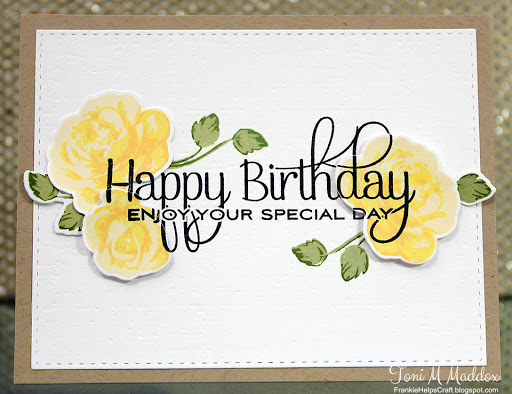 Again I took inspiration from the birthday graphic--love that yellow! I did find the Altenew roses fussy to stamp out but so absolutely gorgeous. I love their vintage quality, don't you? 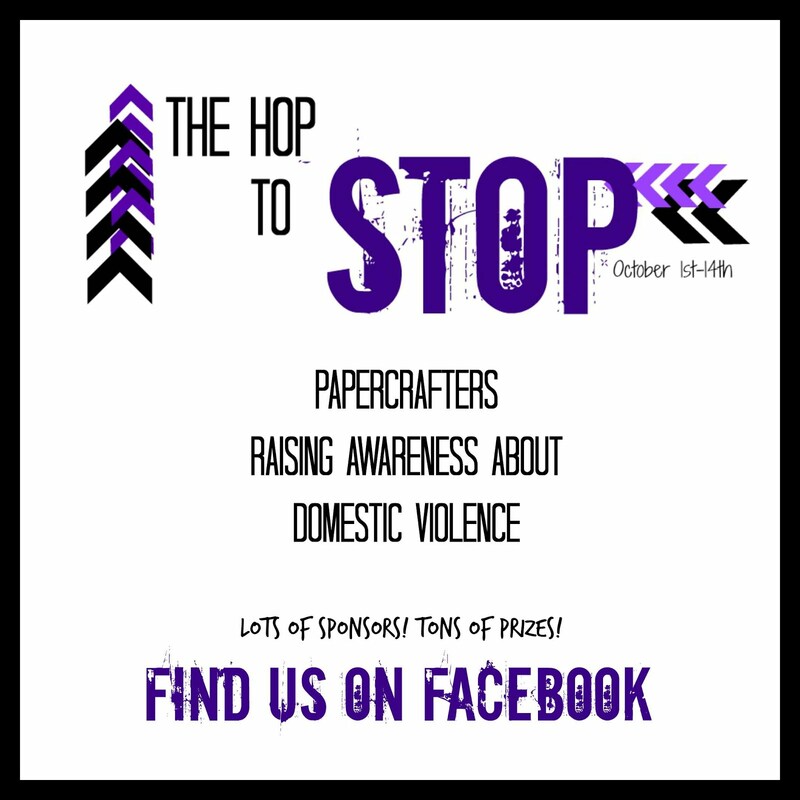 Today is the DAY, the start of Becca's Hop To Stop Domestic Violence. As long as you feature purple on your card and spread some comment love, you can link up. 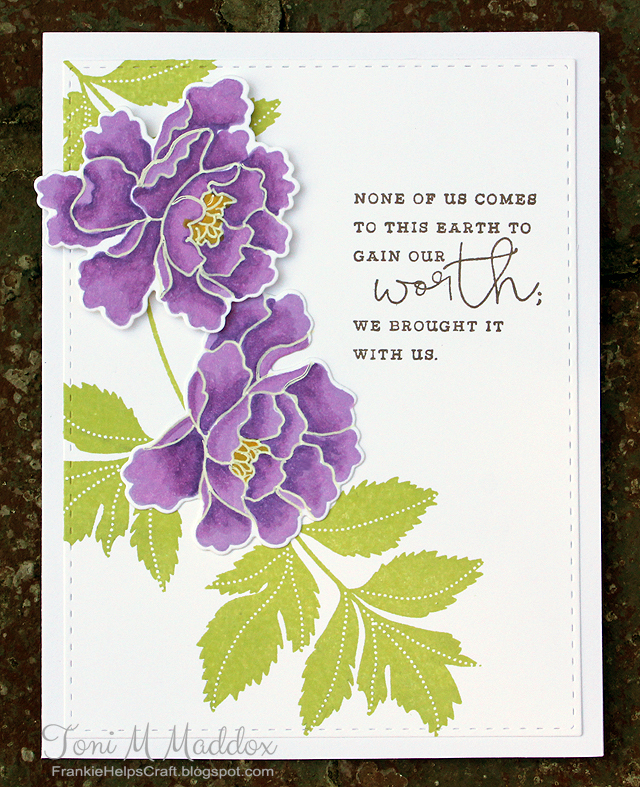 There's also the option of sending her your cards for distribution to those whose lives have been touched by domestic violence. Birthday cards are what's needed most. In my card I used Copics over Hero Arts shadow ink to create the look of watercoloring on the flowers. Just a little white pigment ink pen to cover up the areas where I didn't follow the lines (what a surprise) and those were ready to go. The leaves I stamped straight up. I stamped the sentiment in brown for a softer look. Isn't the sentiment divine? I'm particularly in love with PTI's Choose Joy set of sentiments right now. 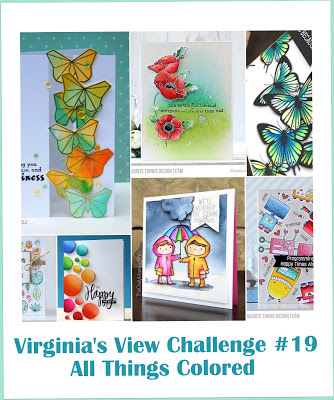 We have a fun House of Cards challenge for you this month. You can choose to use texture on your card or be inspired by the colors of the photo or mix it up and do both. I colored up a fabulous freebie from Marianne Walker of Copic fame. Super easy one and she even has basic instructions. Thanks, MW! I diecut the panel and added the WPlus9 sentiment. I like white space but it was so very plain jane that I decided to use my Paper Studio leaf embossing folder on the whole thing. Love!!!!! 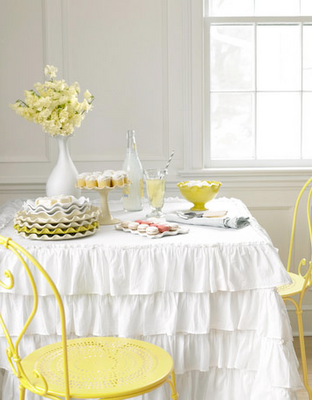 If you haven't already, check out the fabulous makes of my design teammates!